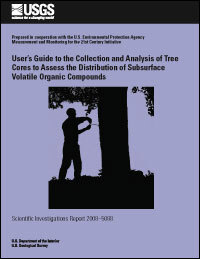 Analysis of the volatile organic compound content of tree cores is an inexpensive, rapid, simple approach to examining the distribution of subsurface volatile organic compound contaminants. The method has been shown to detect several volatile petroleum hydrocarbons and chlorinated aliphatic compounds associated with vapor intrusion and ground-water contamination. Tree cores, which are approximately 3 inches long, are obtained by using an increment borer. The cores are placed in vials and sealed. After a period of equilibration, the cores can be analyzed by headspace analysis gas chromatography. Because the roots are exposed to volatile organic compound contamination in the unsaturated zone or shallow ground water, the volatile organic compound concentrations in the tree cores are an indication of the presence of subsurface volatile organic compound contamination. Thus, tree coring can be used to detect and map subsurface volatile organic compound contamination. For comparison of tree-core data at a particular site, it is important to maintain consistent methods for all aspects of tree-core collection, handling, and analysis. Factors affecting the volatile organic compound concentrations in tree cores include the type of volatile organic compound, the tree species, the rooting depth, ground-water chemistry, the depth to the contaminated horizon, concentration differences around the trunk related to variations in the distribution of subsurface volatile organic compounds, concentration differences with depth of coring related to volatilization loss through the bark and possibly other unknown factors, dilution by rain, seasonal influences, sorption, vapor-exchange rates, and within-tree volatile organic compound degradation. For more information, please contact Don A. Vroblesky.